Some believe landing a job with a major corporation is the pinnacle of success, especially if you work with computers. Big businesses have more money to pay big salaries, provide more valuable benefits, and hand out more perks. They can afford to supply their employees with state-of-the-art equipment. Small business workers scrape to get by while plotting to move up to the corporate world. Right? Maybe not; a recent GFI® survey shows that full-time computer users who work for small businesses enjoy a higher level of job satisfaction than the average American full-time worker. 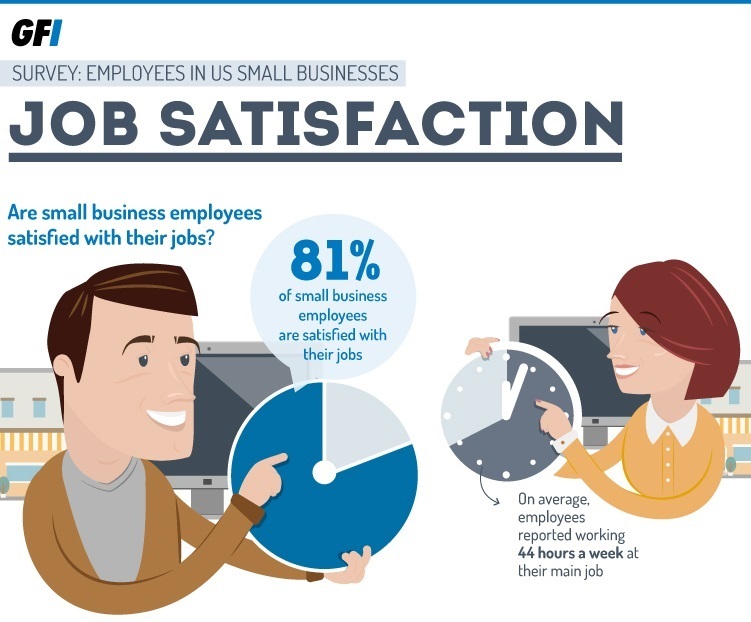 Here are the numbers: 81 percent of small business workers surveyed are satisfied with their jobs. Compare that to 68 percent of all full-time workers (Rutger’s University survey, Jan. 2013). Despite the perception that small businesses are more vulnerable to cutbacks and layoffs, more small business employees are happy with their job security (62 percent vs. 51) as well as the age at which they expect to retire (40 percent vs. 31). And even though it would seem there are far more opportunities for advancement in a large enterprise, the “little guys” also outscored the average on that one (46 percent vs. 35. When it comes to income and healthcare coverage, the two groups were close to equal, although the small business workers still maintained a slight edge of 1-2 percentage points. And even though we all know money can’t buy happiness, it does contribute to job satisfaction; those with higher incomes expressed greater job satisfaction, and those with more education tended to be more satisfied with their incomes. Sadly, women expressed more dissatisfaction with their jobs across the board than men. One could speculate on the reasons – and I can think of many – but that’s a subject for a different blog post.